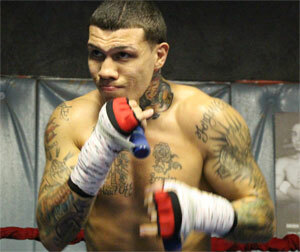 North Philly junior middleweight "King" Gabriel Rosado started 2012 as a fairly well-kept boxing secret, just another tough kid with a modest record of 18-5. He was popular among Philly fight fanatics, but uninteresting to the TV networks and boxing power-brokers that make the fights that change lives. However, 2012 changed all that. In his three starts during the banner year, Rosado appeared to galvanize his exciting, hard-pressure style, and looked better and better each time out against increasingly tough competition. He knocked out everyone he faced in 2012, and each time did it on a nationally televised edition of NBC Sports Network's fledgling Fight Night boxing series. 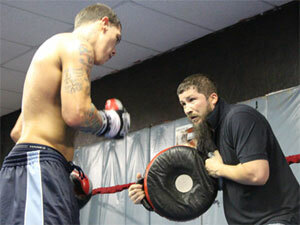 "It was pretty much like a new me," Rosado said. "I guess everything that me and Billy (Briscoe, trainer) been through kind of kicked in this year, and we've just been in our zone now." His surge improved his pro record to 21-5 (13 KOs), and stepped him closer and closer to a world title fight at 154 pounds. By the time he stopped tough Charles Whittaker in a September title elimination bout, Rosado had earned the #1 spot in the IBF junior middleweight rankings, and became the mandatory challenger for IBF champion Cornelius "K9" Bundrage. Suddenly the future looked very bright for Rosado. Not only did he have that mandatory title shot on the horizon, there was also a full roster of other talented and popular junior middleweights (Trout, Cotto, Kirkland, Lara, Molina, etc.) to fight over the next few years if he became champion. Of course in the back of Rosado's mind was an eventual dream match with Saul "Canelo" Alvarez, the young, popular stud of the junior middleweight division, a Golden Boy Promotions cash cow, and the man among 154-pounders. Logic said that if Rosado could beat the man, he'd become the man, and get the stardom and money that came along with it. For the first time in his six-year career, the path before Gaby not only seemed obvious, it was as straight as an arrow and lying directly in front of him. All he needed to do was stay the course and wait for his title shot. 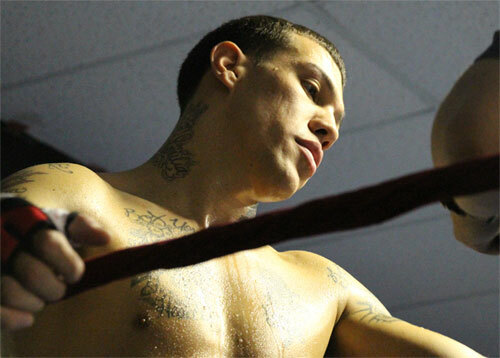 However for Gabriel Rosado, the road less travelled has always been the best way for him. So instead of staying on course, and using the boxing capital of his breakthrough year the way everyone thought he would, Rosado took another one of those career detours that keep coming his way. In December, Top Rank & K2 announced that Gabriel Rosado would jump up a division and become the next challenger for highly regarded middleweight phenomenon and WBA champion Gennady Golovkin. By all accounts, Golovkin is a far tougher test than Bundrage or anyone else at junior middleweight would have ever been. Nevertheless, Rosado took the fight and left his mandatory status as a junior middleweight behind. By taking a WBA title fight at middleweight, Rosado gave up his IBF #1 ranking and mandatory shot at the 154-pound title. The risky move, a gamble of everything he's worked for so far, surprised everyone. But that's Gabriel Rosado. 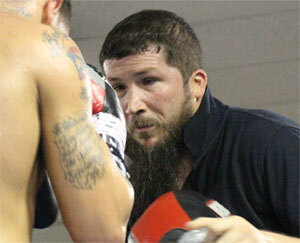 "That's what he does," said Rosado's head trainer, Billy Briscoe. "He dares to be great. I believe we would have beat "K9" relatively handily. K9's a 38 year old man, but Gaby wants to take the fight that people don't give him a snowball's chance in hell of winning. That's the fight he's looking for, and I believe we beat this guy." Rosado did have options, and it wasn't an easy choice. He had a chance to sign with Golden Boy, the promoter of most of the key junior middleweights in the world, in a move that would have folded Rosado into the mix with all of those top 154-pounders. However, Rosado didn't take the attractive contract for one simple reason - the offer did not include a specific proposal for a title fight with Bundrage or any other junior middleweight champ. Signing the contract would have made Rosado a Golden Boy fighter, but it did not mean that he'd be the next challenger for the IBF belt. Despite the obvious advantages of being under the Golden Boy banner, Rosado did not want to be put on a shelf and forced to wait for his chance. Instead, he decided to move forward and grabbed the opportunity to fight Golovkin for the middleweight crown on HBO on January 19th. "He's a bad man," Briscoe said of Golovkin. "He's the Big Bad Wolf. Gaby called me up and asked me what I thought. I told him that I think we (can) beat the guy. The thing with Gaby is that he's never been babied before. So why start now? You know, let's dare to be great." Rosado feels the same way. "It kind of feels like destiny," Rosado said. "I'm just going to take advantage of it. It's a fight that my career has prepared me for. This is a guy that everybody is considering to be the next best thing. I've been in this situation before, with the hype around him and things like that, but the difference is that now I'm seasoned and I know what it takes to pull this victory off." There is little question that Golovkin is a formidable foe. The German-based Kazakhstani is undefeated as a professional, but his 24-0 (21 KO) slate is just part of his resume. "GGG" was also a world-class amateur boxer with hundreds of bouts, an Olympic Silver Medal to his credit, and amateur wins over Lucian Bute, Andy Lee, and Andre Dirrell. As a professional, Golovkin has handled sturdy Philadelphian Lajuan Simon (by 1st round, one-punch KO), the always rough and ready Kassim Ouma (TKO 10), His most recent outing, against Grzegorz Proska, was an impressive HBO blowout (TKO 5). Most of the other names on Golovkin's record do not exactly jump out at you. But make no mistake, he's a stern test for Rosado, or anyone else. 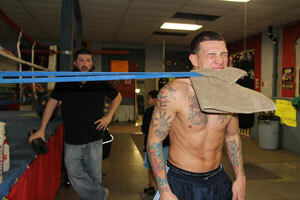 However as usual, Rosado likes his chances. "Everybody looks at me as the underdog, but I don't" he said. "I'm confident going into this fight. I feel like the guy's style is tailor-made for me. I see opportunities (in that style)." "Gaby's whole career prepared him for this moment," said Briscoe. "Churchill made a great speech when he was about to enter the Second World War that said 'I feel as though everything in my life has led me to this moment'. Same thing for us. Gaby's prepared. He paid his dues. He learned his craft. He took the road less travelled. Fought for nickels and dimes. Fought King Kong, the Loch Ness Monster, and now we have to fight the Beast From the East." 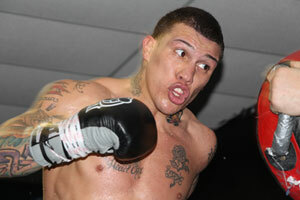 "I'm looking at it like another fight," Rosado said. "I'm not caught up in the hype. I really think the guy's a good fighter, but I just look at it as another fight. I feel like with him, you got to be in great shape. I can't take him lightly because the guy can fight, but I think I'm going to be able to capitalize on the things that he does, the mistakes that he makes, and I think it's really going to make me look good." The fight, with both the WBA and IBO middleweight titles at stake, was originally made at a catch-weight of 158 pounds to compensate for the fact that Rosado is moving up one division for the fight. However Rosado, in another display of confidence, has tossed the idea of the catch-weight and has asked for the fight to be at the normal middleweight limit of 160. "I don't want there to be any excuses," Rosado said, predicting what Golovkin might say if Gaby were to pull the upset at 158 pounds. "I don't want there to be any questions. I think I'm a middleweight that can still make junior middleweight. But this is a middleweight fight and I want the fight at 160. I think I'm going to be stronger in the fight (at the higher weight)." It's a ballsy move, a double down on a bet that some already think has long enough odds against Rosado. 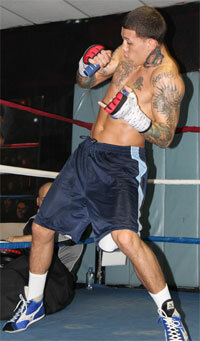 But once again, that's Gabriel Rosado. He's a confident fighter with a mission, and is not intimidated by Golovkin's reputation and obvious skills. "This guy (Golovkin) is everything they say he is and more," said Briscoe. "He's a tremendous fighter. But at the end of the day he's just a fighter, and every fighter is beatable. We're going to find a way to win. But after we win, I don't want to hear that this guy was a bunch of hype, or that he wasn't the genuine article. When we win, give us our respect." Rosado said, "I don't want to feel him out. I just want to go straight to work. (With Golovkin) what you see is what you get. I don't think this is a guy that you have to feel out and see what kind of angle he's coming from. He's pretty much fought every pro fight almost the same way. So I pretty much know what I'm going to get myself into with this fight. I think I just gotta stay busy. As soon as the bell rings, get busy with the jab, move my hands, and just go to work and not give up any rounds." "You can't train Gaby harder than we already train him," Briscoe said. "Some fighters you have to push, and some you have to pull back. With Gaby you gotta tie him off with a stake and hope he doesn't break free. He trains extremely hard. He digs down, he grinds it out, he pays the price for victory. I think you're going to see the best conditioned and best prepared "King" Gabriel Rosado of his whole career - physically, mentally, emotionally, psychologically, and spiritually. That's what I think." 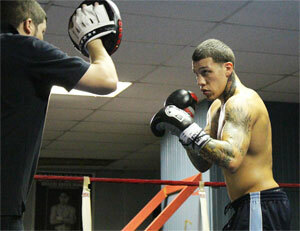 "I'm so focused on the victory," Rosado said. "And I'm focused on what this win is going to do for me. I feel like a win against "Triple G" is going to make me a star. Being Puerto Rican and being an action-packed fighter, the fans are going to want to see me fight." Rosado's road less traveled has led him to the biggest challenge of his career - a fight with the best opponent he's ever faced at boxing's biggest venue on boxing's biggest platform (HBO). Some think he may have bitten off more than he can chew, but that's Gabriel Rosado. He's betting everything on himself. "I saw that this opportunity was about my legacy," Rosado said. "I saw that this is where it all starts. Becoming the middleweight champion against a guy who everyone considers the next big thing. The bigger the lights, the better. Madison Square Garden? The moment's not going to get to me. I'm going to seize the moment. Pretty much everything we've been through has prepared us for this. So we're going to be ready." Golovkin-Rosado is part of a big championship triple header at Madison Square Garden Theater in New York. Also on the card is Orlando Salido vs. Mikey Garcia in a WBO featherweight title bout, and Roman Martinez vs. Juan Carlos Burgos for the WBO junior lightweight championship. All three title bouts will be televised live on HBO.